AUGUST 29, 2017- Join us at 10:00 a.m. to tour the Battleship Memorial Park in Mobile. 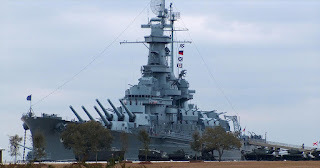 We will visit the USS ALABAMA battleship, the USS DRUM submarine and Aircraft Pavilion. Come discover the history. Please visit http://www.ussalabama.com/explore/uss-alabama-battleship/ to learn more. Please contact Carole Roman roman.carole@yahoo.com to sign up. We must have a total of 10 students to get the discounted price.